A so Quality Coaching Pad Punch Mitt Speed Gloves. Side vent design,Highly flexible high density sponge. more effective in reducing the impact of the kick target people who target. 30P Eva linder, Ensure the overall enrichment, kicked in the long process easy deformation,absorb the impact more efficiently. Wrist part high strength protection, designed to cushion the impact of the curve, thickening sponge to absorb the impact force. 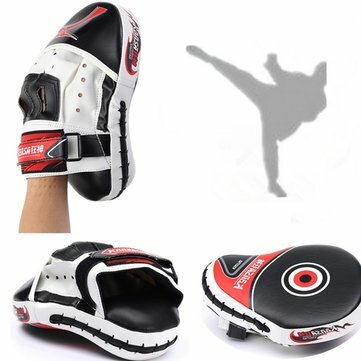 Can be used for Muay Thai Kick Boxing MMA Training Karate. These mitts are a good deal for the price. The Velcro strap isn't great quality but its usable. They are small. This was said in other reviews. They are not made for XL hands. The padding is good and they are light weight. these gloves are mader from hight quality.you can used it for muay thai kick boxing or training karate. is very popular help all minions of this type of sport.